Anxiety, insecurity, military power, racial prejudice, heavy taxes - all these problems of contemporary life were also faced by those who first heard the teaching of Jesus in the Sermon on the Mount. In this book Clarence Jordan points out that this Sermon presents many of the major features of the kingdom of God on earth that Jesus was proposing. - Publisher Includes features of the earthly kingdom of God that Jesus was proposing. 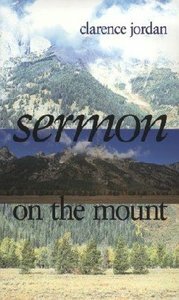 About "Sermon on the Mount"
Includes features of the earthly kingdom of God that Jesus was proposing. Jordan is known for his Cotton Patch Version of the New Testament and as founder of Koinonia, an interracial farming community at Americus, Georgia.